There was a serious amount hype when King Spray was announced for the Vive. At the time the Virtual DRM war was raging on the VR front. Initially King Spray was announced for the vive there were even early alphas in the hands of some VR Spies and associates. Then after some radio silence King Spray was announced for the Oculus Rift. Immediately the Reddit pages blew up again at the possible poaching of another timed exclusive. This was denied in full by the developer and almost as a joke Vive Spray development began. 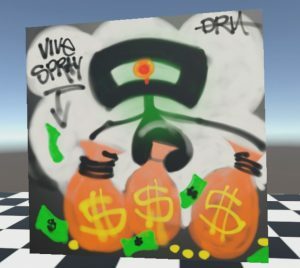 Weeks went by and Vive Spray made it to Steam Early access. There is a subtle jokey gesture with the face of Lord Gaben on the paint cans. I picked up Vive spray as the experience looks like a lot of fun and had a strong foundation. I found the controls to be very intuitive and found a solid experience for a very reasonable price at under 5GBP. If you are not the creative type or have no interest in art then this may not be the experience for you. I had a blast, I put on the some Rap and started testing. Feel free to check out the attached video to see how Vive spray plays. Do not buy this game, the dev never finished the first one, and published vive spray 2 right after ‘releasing’ vive spray 1, seems like a blatant money grab.